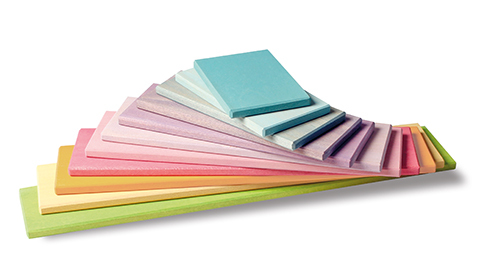 Whilst for many, its all about the Grimms rainbow, for me I prefer the pastel rainbow from Grimms, the colours are just divine, soft and subtle and these pastel boards make an excellent addition to that range. The boards can be used on their own for building or counting fun, or combined with wooden blocks to build towers or bridges. 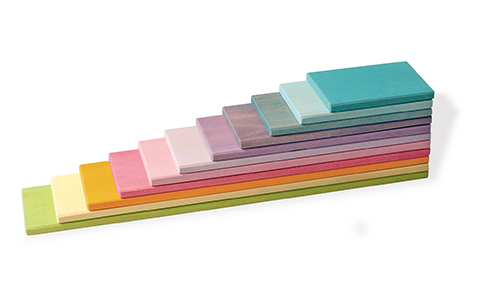 They also fit perfectly with the Grimms 12 piece rainbows so you can make boats or learn about balance. Children will have hours of endless educational fun which fires up their imagination, maybe today they will just make patterns but tomorrow they could be used to build a rocket! For families or nurseries who follow the Waldorf play or Montessori styles, these are a perfect addition, along with the traditional wooden block the open-ended play possibilities and literally endless! Great addition to any collection . Brought this to go with a small pastel collection I had going on. But my daughter loves to use it will her bright rainbow and other Grimm's toys that we have. It has been an excellent buy. Grimms is a family company who design, manufacture and sell high-quality Waldorf inspired wooden toys worldwide. All of the toys are designed at their HQ in Hochdorf Germany. 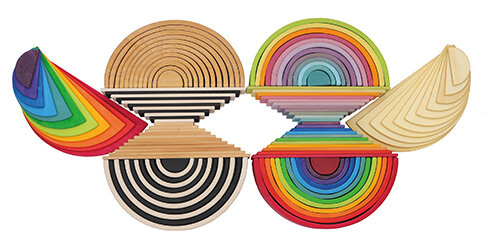 The toys are crafted at various locations in Europe by trained woodworkers. Once the raw products are received, they are inspected and the finishing steps completed back in Germany. All wood is sourced from European sustainably managed forests. The woods used in the toys are Alder, Maple, Lime and Beech. 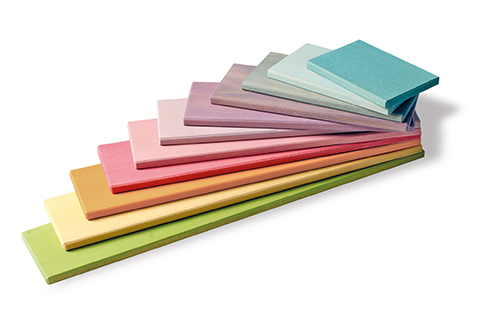 Bright, vivid rainbow Colours and oils used to treat the wood are free from harmful chemicals and non-toxic. Minimal packaging on each product to reduce waste.